The new German Ambassador to Sofia, Matthias Martin Höpfner, was the first guest to try the freshly baked pretzels at the Philipopolis Art Gallery. His Excellency was a VIP guest at the Bavarian Night at the Old Town house-museum and art galery. 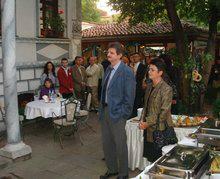 The event was hosted by the German-Bulgarian Chamber of Industry and Commerce.